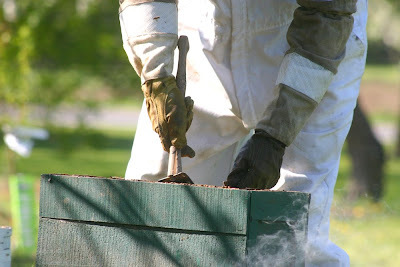 This is the entrance the bees use to come in and out of that box. 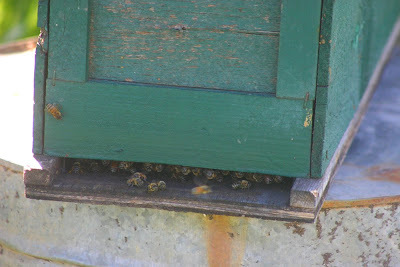 There are guard bees that stand watch, checking to see who is coming and going and protecting the hive. 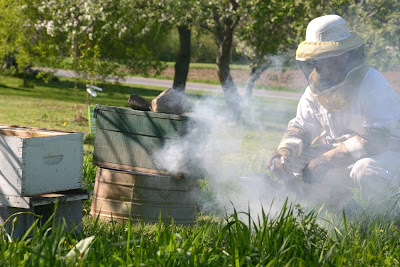 A smoker is used to calm and disorient the bees. Sean has this nifty, handy-dandy tool for removing the frames. I'm sure it has a professional bee-keeping name of which I have yet to learn. 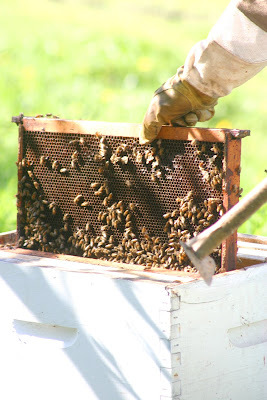 Then he gently carries one frame over to the new hive, saying prayers under his breath, I'm sure and asking me again if his head net is covering the back of his neck. 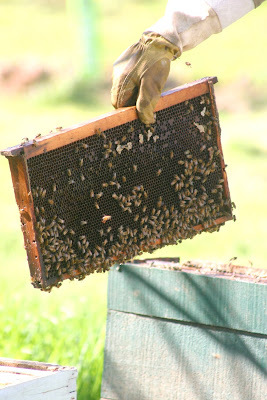 Into the new hive they go. 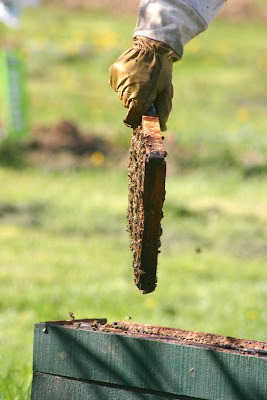 We also put in some homemade bee food, a simple syrup to help get them started. 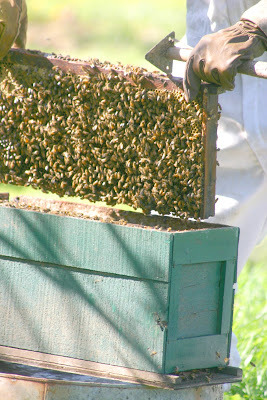 Hopefully this fall we'll have fresh raw honey! Sean's sweet enough without the honey. 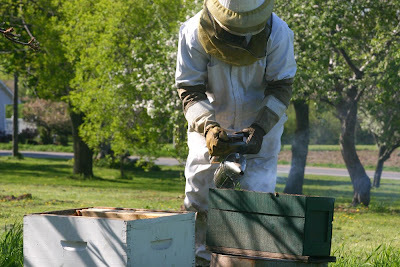 My son, Daniel, started keeping bees this spring for his 4-H project. I too am learning so much. 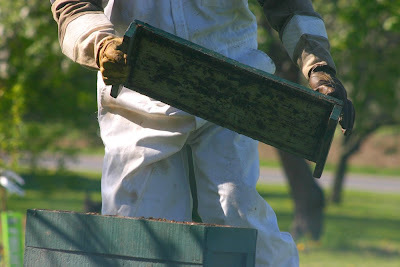 That hive thingy is actually called a hive tool, so I've been told by Daniel. 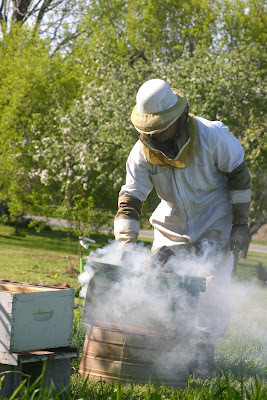 He spent all winter reading books and talking to other bee keepers to find out as much information as possible before he started. So far everything is looking good. 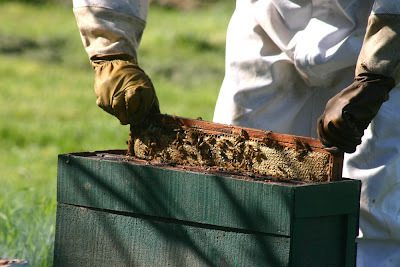 It's nice to see your posts and to see someone else keeping bees. I can see by the way your husband is doing it that Daniel actually has learned a lot. I hope your hives do well. oh oh oh! Bliss! 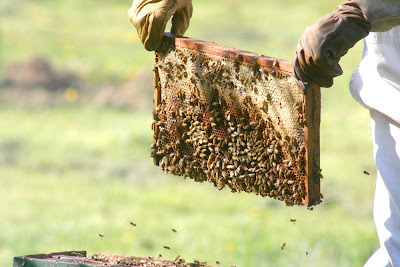 I would LOVE to keep bees.....don't think the neighbors would approve though!